With shows like American Horror Story, words like "asylum" and "sanitarium" don&apos;t exactly go hand-in-hand with the idea of a tranquil refuge, but the historic Rockhaven Sanitarium is the exception. 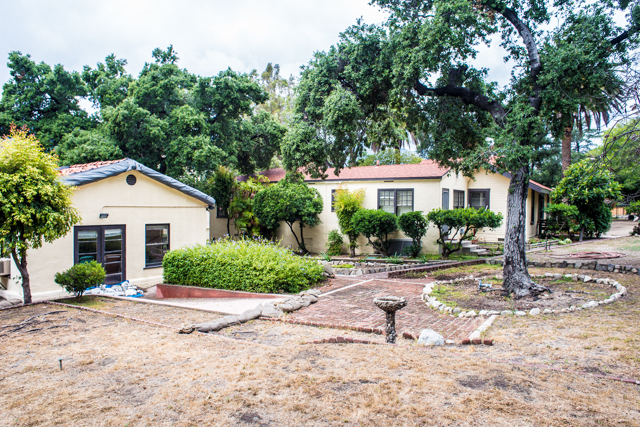 Rockhaven, which sits by the foothills of the Verdugo Mountains in Montrose, is a special place with a fascinating history. For over 80 years, it was a feminist sanitarium run by women and for women—even attracting some notable stars from the golden age of Hollywood. Even though the 3.5-acre property is now vacant and worn from time, it still exudes the kind of peaceful vibes that you&apos;d expect from a secluded retreat. With the compound being nearly a century old, there are also plenty of ghost stories at Rockhaven. Rockhaven Sanitarium inhabits a beautiful space. It&apos;s made up of Craftsman houses and Spanish Colonial Revival cabins that are labeled with summer camp-like names like "The Willows" and "The Pines." Brick and rock walkways pave the path for peaceful strolls, and massive oak trees provide shade throughout the property. 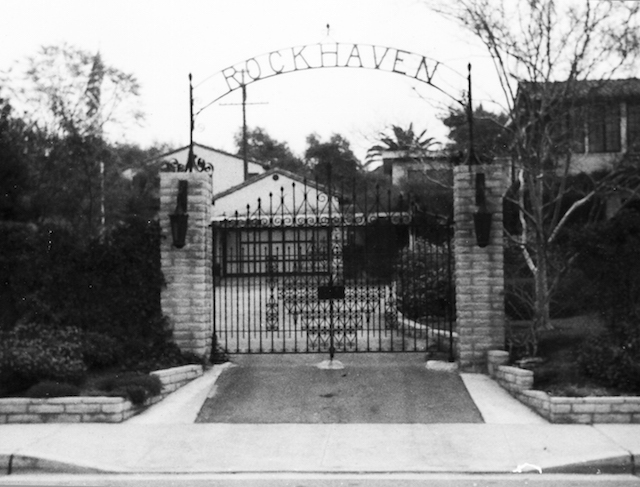 A striking, wrought-iron gate emblazoned with the word "Rockhaven" serves as the entrance to the property. Detailed architectural designs from Rockhaven&apos;s past are even still around today, like the Malibu tiles that line rows of staircases, and the griffin statue that rests on top of a light fixture. If you walk through the buildings today, you&apos;ll find that each of them seem frozen in time. Vibrant floral wallpaper covers the walls and even the ceilings in some of the rooms—a very Victorian touch. Walls are painted in bright hues of teal, pink and lavender. Bedrooms are filled with old mattresses, floral and tweed recliners, and mid-century furniture. 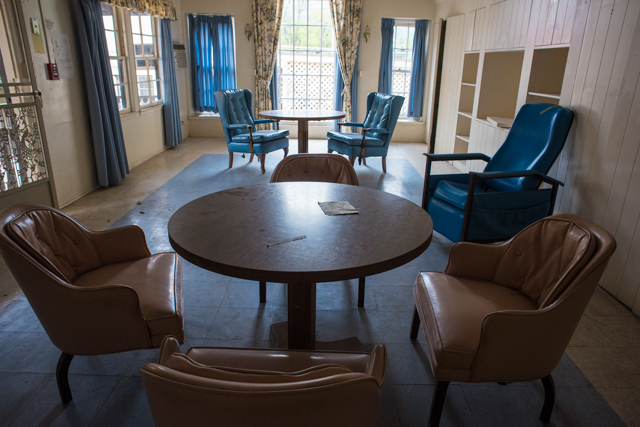 With the way the rooms are decorated, it appears as if the residents of Rockhaven just vanished and left all their belongings behind. It&apos;s equally fascinating and eerie. Members of Friends of Rockhaven—a nonprofit group that maintains the sanitarium and educates others about it—discovered a treasure trove of old patients&apos; trinkets in a basement after the facility shuttered for good in 2006. 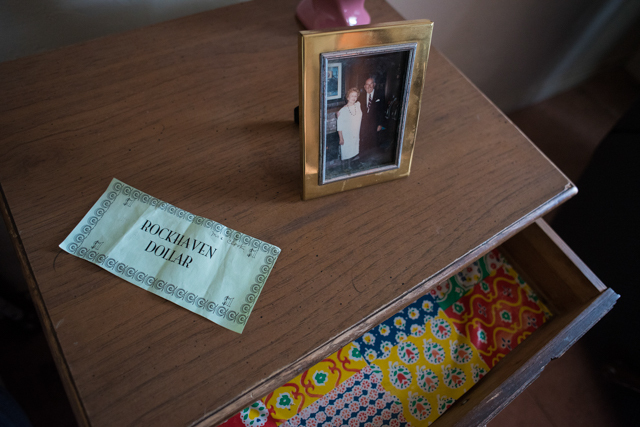 They used these items to decorate the rooms, creating a time-capsule of Rockhaven&apos;s heyday. The main living room has a vintage Singer sewing machine from England, desks are covered with framed photos of family members, a makeup box holds a tiny bottle of old Valium, and closets are filled with hat boxes and dresses sporting fashion from the 40s to 60s. One of the creepiest spaces on the property is the one that houses all of the old hospital beds. Burnt-orange curtains and teal-colored wheelchairs match the barren mattresses. Outside, a weathered Gladding, McBean statue of a smiling woman reclining and sunbathing in a fountain—who&apos;s often referred to as the "Lady of Rockhaven" by members of the nonprofit—serves as the property&apos;s symbol. "She represents what Rockhaven was: a place where you could relax and become yourself again and drink in the sunshine and be outside," Joanna Linkchorst, the president of Friends of Rockhaven tells LAist. "She&apos;s also pretty beat up like Rockhaven is." It&apos;s true: Rockhaven isn&apos;t as majestic as it once was. Some portions of the buildings&apos; walls are spotted brown from water damage, paint chips have fallen onto the carpeting, and black tarps cover entire sides of buildings. In one room, the wallpaper is peeled back to reveal the black, ink-like roots of a tree that have grown into one wall. The City of Glendale, which owns the property, allows members of Friends of Rockhaven to visit the space twice a month. The city apparently spends $50,000 a year to maintain the grounds, but that&apos;s not enough to keep Rockhaven in shipshape. The nonprofit visits the compound monthly to clean the property and tend the gardens. While the sanitarium is closed off to the public, Friends of Rockhaven provide tours every so often. However, these Rockhaven supporters may not have much more time with their beloved sanitarium, as the city is planning on selling the property to a developer—a point of contention between the city and the nonprofit. Linkchorst, who&apos;s given countless tours of the property, knows the history of Rockhaven like the back of her hand. I visited Rockhaven on a recent cleaning day as she discussed the sanitarium&apos;s past. Rockhaven, which was established in 1923, was the brainchild of nurse Agnes Richards—a German woman who immigrated to the United States at the age of 11. She first landed in Hastings, Neb., where she met her husband. The couple moved to Chicago, where they had their first child together, but tragedy struck: Six months after their first child was born, her husband died. Richards then put herself through nursing school and worked in the Red Cross during World War II. She eventually remarried and moved to California to work at San Bernardino&apos;s Patton State Hospital, and later at the L.A. County hospital. Richards had spent her life helping others in psychiatric treatment and was appalled by the conditions of sanitariums, especially with the abuse towards women. Women could easily be sent to asylums for issues like menopause or "hysteria." Richards wanted to do something different, which spawned her idea for Rockhaven. About a century ago, the Crescenta Valley was viewed as a haven for relaxation and clean air. Sanitarium began popping up all over the area—many for respiratory diseases like tuberculosis and some for mental health. Now, Rockhaven is the last one of its kind still intact, according to Linkchorst. Richards found a plot of land in Montrose (then called Verdugo City) and a two-story rock facade house with a gorgeous, mountain view. She brought with her six women to run the sanitarium with her; within a year she increased her number of employees to 24. 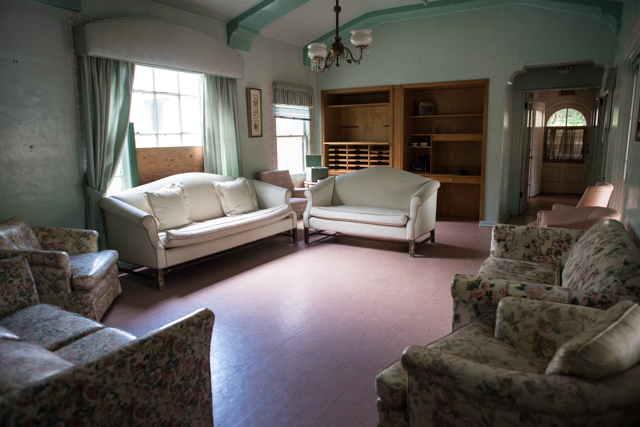 Richards began buying Craftsman cottages, and in 1929, she started hiring contractors to build Spanish Colonial Revival dorm-like buildings—complete with Murphy beds that are still intact today. Richards was able to grow her sanitarium even though it was operating in the throes of the Great Depression. Her granddaughter Patricia Traviss would tell people that you don&apos;t make a lot of money running a sanitarium, but her grandmother was a shrewd investor. Richards invested in lots of land and property, enabling her to hire more women and erect more buildings at Rockhaven. In an early brochure for Rockhaven, it read that it catered to women who had "mild mental and nervous disorders." Richards never called the women of Rockhaven "patients," but rather referred to them as "residents" or "ladies." Her goal was to treat the women with the utmost respect and dignity. Instead of locking the residents up, Richards wanted them to be active and recover so they could return to mainstream society one day. She built beautiful gardens and walkways and raised chickens, so it would foster a positive environment. Richards took the ladies on trips with her to the beach or opera. She got them gussied up for the events. During the interview process for admittance into Rockhaven, the residents were told that they had to be ambulatory and make their way to gatherings and take walks around the gardens. The sanitarium even served famous folks like silent film actress Billie Burke, who is best known for her role as Glinda the Good Witch in The Wizard of Oz; Marion Rose of vaudeville act Statler and Rose; Broadway actress and producer Peggy Fears; Clark Gable&apos;s first wife, Josephine Dillon; and Gladys Baker—the mother of Marilyn Monroe. Monroe&apos;s mother, who was known to be "dramatic," had apparently made several successful attempts to "escape" from her room. Even though her room had large windows and doors, she once tried to escape by tying her bed sheets together and climbing out of her tiny closet window instead. Her room was in a one-story building. It wasn&apos;t cheap to stay at Rockhaven. Linkchorst said she was told that it cost $800 per month in the early 1960s for Baker to stay at Rockhaven—equivalent to around $6,000 today. There were normally about 80 women who would live at Rockhaven at a time, though at one point, it hit a max of 120. "I don&apos;t know how they fit [that many residents]," Linkchorst says. By the 1950s, Richards wanted to do some traveling. She left her granddaughter, Traviss—who had grown up around the ladies of Rockhaven—in charge of the sanitarium in her absence. 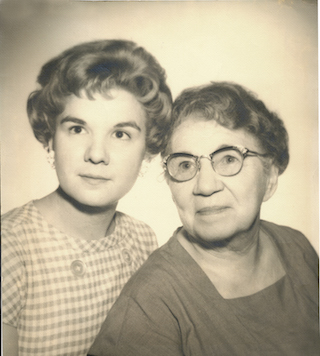 Whenever Richards would return from her travels, Traviss said her grandmother was, of course, still the one in charge, according to Linkchorst. Longtime Friends of Rockhaven volunteer Vivian Wait used to visit Rockhaven when it was still in operation. She used to groom Traviss&apos; dog, Chi Chi, and pick up and drop off the canine there. Wait tells LAist that Rockhaven was "gorgeous" and "pristine" at the time, and the landscaping was immaculate. The gardener would plant flowers for different occasions, like mums for Mother&apos;s Day and tulips for Easter. When Richards passed away in 1967, Traviss was fully in charge. By then the views on mental illness had evolved, and it wasn&apos;t as easy to commit a woman over things like a nervous breakdown or menopause. Rockhaven became a treatment facility for women with Alzheimer&apos;s and dementia. The ladies who stayed at Rockhaven were now older and using wheelchairs, but Traviss still made sure that the ladies "lived up to their potential," Linkchorst says. They still had to get out of their rooms to eat meals together in the dining area. There are photos of caretakers reading books to the women sitting in wheelchairs, and the ladies getting propped up in swings. Traviss wanted the women to still look presentable as well. She had high school girls come by to paint their nails and dress them up. She brought in occupational therapists to teach the residents arts and crafts, and organized gardening and nutritional classes. Even if the ladies didn&apos;t remember what they had done that day, Traviss "realized that if you kept them in the here and now, they were less likely to go back in their minds and be confused," Linkchorst says. At the time, Traviss was taking a decorator&apos;s class from a woman who later offered to paint the rooms for free, as long as everyone would keep track of how the residents of Rockhaven felt in the vibrantly colored rooms, so she could figure out which colors would work best. Those colors are still there today. In 2001, Traviss was ready to retire and sold Rockhaven to the Ararat Company, which ran it as a mental facility until 2006. When they shuttered their doors, the fate of Rockhaven was in limbo and there were plans to have it sold it to a developer, and talks about it potentially getting razed. That&apos;s when the City of Glendale stepped in and purchased the land for $8.25 million. Linkchorst says that at the time, the city had plans for Rockhaven. They were going to sell the property&apos;s vacant lot across the street to Trader Joe&apos;s, and then use the money from the land lease to fund the maintenance of Rockhaven. The sanitarium would have served as a park and community center, with the city&apos;s old library moving into the facilities, and the fire department expanding there. "And then the economy tanks and nothing moves forward and [the city] tells us be patient and that something will happen," Linkchorst says. "And we were patient and the something that&apos;s happening is now they&apos;re selling it." Tom Lorenz, the City of Glendale&apos;s Director of Communications, tells LAist a different story. "We never had any money programmed to do anything with [Rockhaven]. People were talking about it, but the City Council never provided any direction on what to do with the property." The city is currently looking at prospective plans from potential developers and investors to purchase Rockhaven. It&apos;s frustrating for Linkchorst, who&apos;s spent a great deal of time trying to get the city to not sell Rockhaven because of its historical significance. In April, the Glendale News-Press reported that the city was considering having the site turned into a mental health facility or retail center. Linkchorst doesn&apos;t believe that Rockhaven would make a good mental facility today because it wouldn&apos;t be easily made compliant to ADA regulations. "I don&apos;t think 20th century issues are going to be met in 1920s buildings," she said. Plus, if it became a mental facility, it would be completely closed to the public. She&apos;d rather see it as a public space: a historic park and museum, and perhaps a venue for other shops, restaurants and art that would preserve the historical value of the property, so that the public can enjoy visiting Rockhaven&apos;s premises. Lorenz says that when the city purchased Rockhaven in 2008, the recession hit soon after; they&apos;ve just been sitting on the property since. They don&apos;t have the funds to get Rockhaven up to safety standards or maintain it. "To update water and pipes, and electrical, it would cost hundreds of thousands alone," Lorenz says. "Because of that, we&apos;re looking for alternatives. That&apos;s why we can&apos;t operate another park." He says that they&apos;re trying to "work with people who have an interest in developing and maintaining its historical value," and that it could become a public-private partnership, or just a private partnership, depending on the new owner. 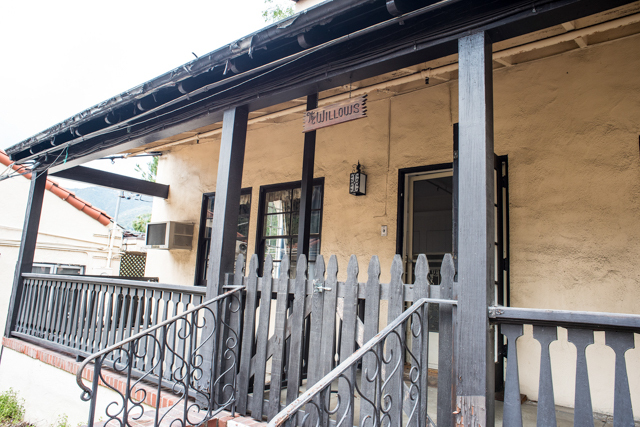 Friends of Rockhaven recently enlisted the help of Pasadena&apos;s Historic Resources Group to get the property on the state register of historic places. They succeeded in getting a unanimous vote in their favor from the State Historical Resources Commission on April 18. It&apos;s now being considered for the National Register of Historic Places. Lorenz says that the state register listing doesn&apos;t really change anything. He uses the example that if a homeowner owns a historic property, he or she is still allowed to make changes—like the addition of a swimming pool. He also says that they&apos;re still planning on going ahead with selling the location. However, Linkchurst says ideally, the fact that it&apos;s now listed as a historic place can cause some restrictions that protect the property. For example, if the new owner and developer would want to knock down one of Rockhaven&apos;s buildings, Friends of Rockhaven could challenge it and the decision could go in front of the city&apos;s historic commission for consideration, she says. "Our decision to not support the pending National Register nomination reflects only our concern that some developers may be — needlessly, we recognize — apprehensive about buying a listed property," Ochoa wrote. His letter also noted that city officials are aware of "the historical importance of Rockhaven" and that the city is working to find a buyer "who will have the vision and resources to commit to both a full rehabilitation of the historic buildings and landscape, and the reinvigoration of the site through a new and appropriate use." What&apos;s most perplexing to members of the Friends of Rockhaven is that the city said they&apos;d want the "adaptive reuse" work done first before it would be listed on the registry. But Friends of Rockhaven managed to secure its place on the state register anyhow. Lorenz says the City has had a good track record with the sale of other historical properties in Glendale. He cites examples like the Grand Central Air Terminal, which was purchased by Disney; and most recently, the Glendale Masonic Temple that was bought by Caruso Affiliated and has had an "adaptive reuse transformation" to turn the site into offices and retail stores. But that&apos;s not to say there haven&apos;t been any objections. According to Glendale News-Press: "The Glendale Historical Society had some objections to changing the layout, but Caruso officials said some modifications had to be made to create usable office space." While the future of Rockhaven is in limbo, there are some traces of the past left, in the form of ghost stories. While I toured the premises, Linkchorst pointed to a mysterious, dusty hand print on a wall. Phaedra Walton, a Friends of Rockhaven docent, shared many of the sanitarium&apos;s creepy stories, explaining that many paranormal groups have investigated the premises. The groups have told her that there are indeed spirits at Rockhaven, but they don&apos;t give off angry vibes, but rather just happy ones. Other spirits are confused as to why they had to leave such a peaceful place. Walton told the tale of a previous Rockhaven caretaker who saw a suspicious light turned on in the second story of the locked Willows cottage. He got into the building and turned off the closet light. The caretaker thought it was strange that the light was on at all, and went back upstairs to see if it would turn on again, but it wouldn&apos;t.
Former Assistant City Manager Bob McFall, who fell in love with Rockhaven and would often photograph the property, saw something strange as well. He was looking at the second story window of The Willows cottage, which was empty at the time, and noticed the curtains were moving. He went to check on the door, but it was locked, so he took a photo of the window from the outside. When his photo developed, it was said that there was a man&apos;s face that was in the image. Walton says that Rockhaven&apos;s caretakers have also talked about clocks randomly resetting themselves, doors slamming out of the blue and voices mimicking people. All these things—from the ghost stories to the rich history of this amazing sanitarium—makes it a place that you could lose yourself in for hours. It&apos;s also a place you won&apos;t want to see change.